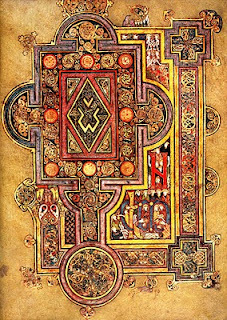 The Book of Kells is one of the great treasures of Ireland. I have an special affinity for hand-written manuscripts, but especially so for ones with a great story. 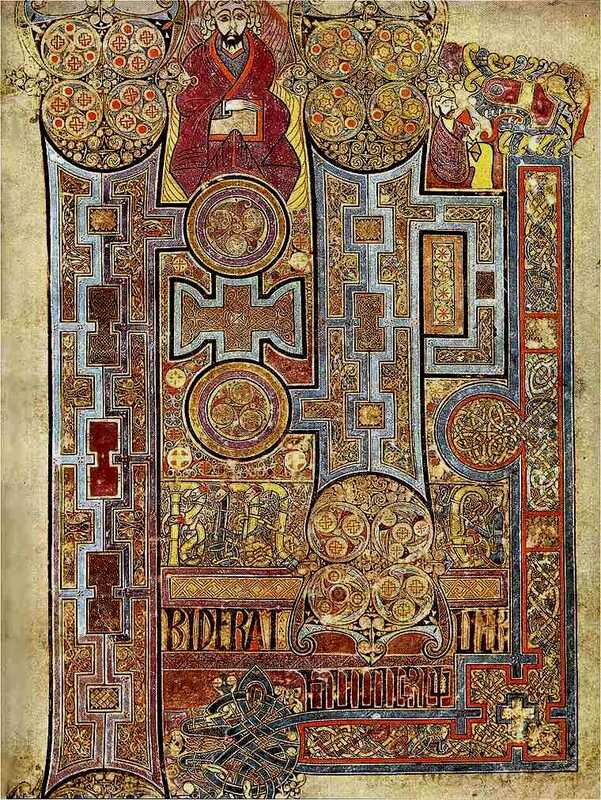 It is understood that Irish Columban monks living on the remote Scottish island Iona, created this manuscript around the year 750. 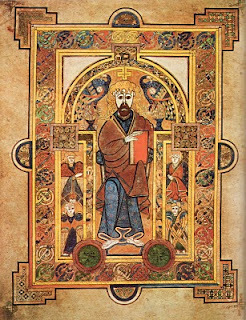 Iona was the center of St. Columba’s influence, and was where his church was located. 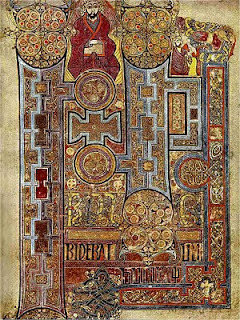 The Book of Kells contains the four gospels, a section of Hebrew names, and the Eusebian canons, and it is also known as the “Book of Columba.” In 878 “The Annals of Ulster record that following another Viking attack, the shrine of Colm Cille and 'other relics' are taken to Ireland.” How can it get worse than to be plundered by Vikings? (It can!) In 1066 "The Book is stolen for its cover of gold, inset with precious stones. Months later it is found buried under sods of earth in a bog, without its cover." After this point it was evidently kept fairly together, but the final restoration and binding did not happen until 1953! 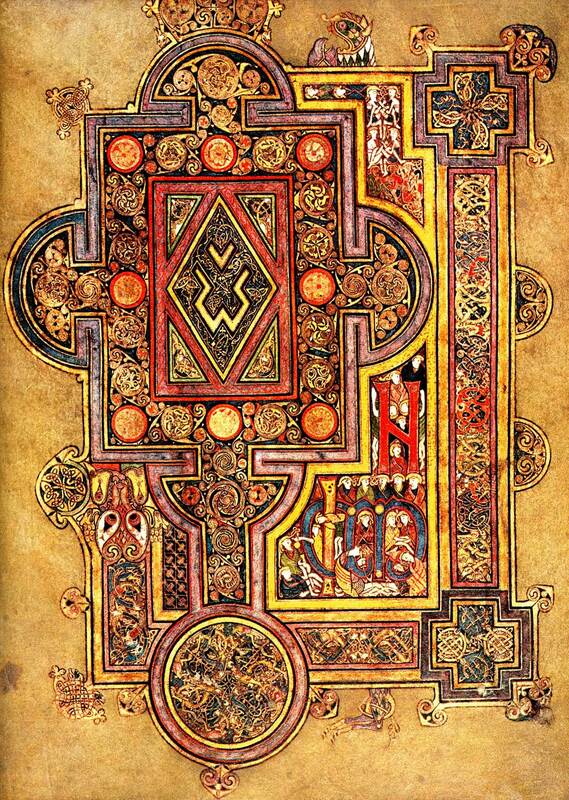 Here are a few of the pages of this beautiful treasure. If you click on them, they will enlarge so that you can see what they really look like. Just gorgeous! So what do you do when your son develops a serious desire to learn guitar, goes so far as to purchase a guitar with his own money, but you don’t have the extra money yourself to do weekly lessons? I think Jerry Jennings, Beginner Guitar Complete Course, is the answer. It has been an excellent choice for us! The Complete Course comes with: Beginner Guitar Complete Course Study Guide, Guitar 1 Start Out Jammin’ Book & DVD, Triad Magic Book: An Introduction to Guitar Chord Theory (with online video access included), Easy Classic Rock Licks DVD, Beginning Guitar Supplemental Exercises, Posters and Flash Cards. Each of these individual books are stand-alone resources and are individually around $20 on their own. This complete package is priced at only $89. One month of lessons at our local guitar store is $120. This resource has eight months’ worth of weekly lessons! Break out the Guitar 1 Start Out Jammin’ Book/DVD. Work closely with the video to make sure you’re getting your fingers in the right place. Most sections start with a how-to and then follow with a song using the chords or techniques you’ve just learned. Additionally, we will work with the Supplemental Book and online videos. The Study Guide has 32 weeks of lessons and they progress step by step so my student has been learning right along with his digital teacher. My 15 year-old son said he feels the curriculum explains the concepts well (and he started with very little previous guitar knowledge). He felt the DVD kept him on track and he used it to “check and balance” himself to make sure he was doing the lessons correctly. He is progressing smoothly through the package and he is about halfway through the lessons. I am now listening to him play actual songs that I can recognize and that is extremely exciting to me (and to him!) He is really learning and I am thrilled with this product. The program comes with posters and flashcards. The posters are 8.5” x 11” cardstock and are clearly printed with an eye-pleasing readable font. The posters are: Open Position Notes, The Staff, Triads, Key Signatures, and Circle of 5ths. The flash cards are: Time Signatures, Clefs, and Staffs, Key Signatures, and lastly, Note & Rest Values. I did the “set it and forget it” method of using this program precisely because I had no previous knowledge of guitar. I wanted to see if he could learn on his own because a lot of music programs promise this result, but not all of them deliver. This one does. 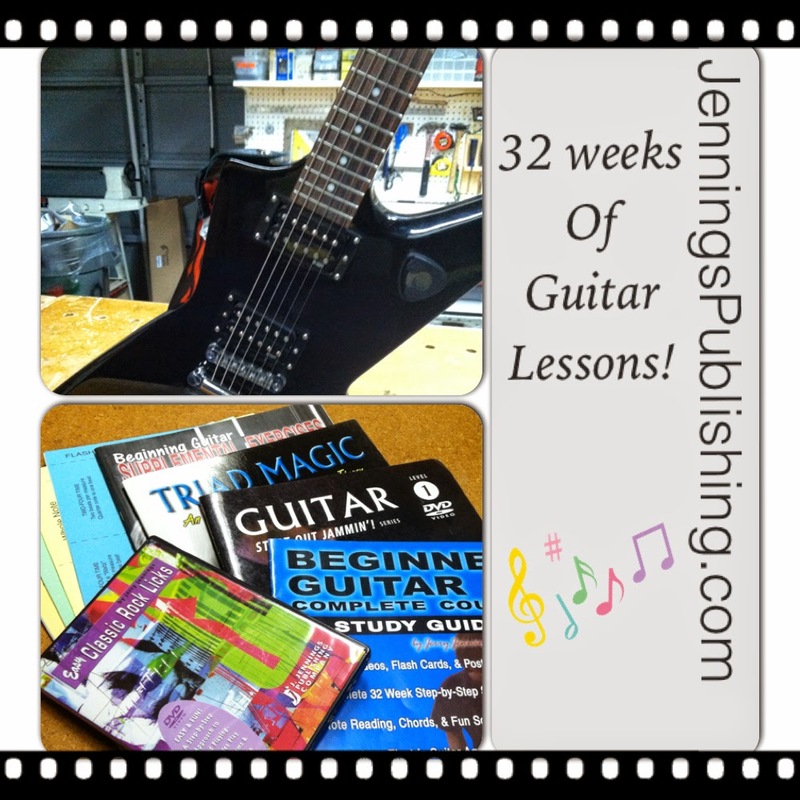 I highly recommend Jerry Jennings’ Beginner Guitar Complete Course. (I received a free copy of this product from Jennings Publishing for review for The Old Schoolhouse Magazine. I was not required to write a positive review nor was I compensated in any other way. All opinions I have expressed are my own or those of my family. to the melody of the lyre. at the works of your hands I sing for joy. How great are your works, O Lord! Your thoughts are very deep! but you, O Lord, are on high forever. all evildoers shall be scattered. you have poured over mea fresh oil. my ears have heard the doom of my evil assailants. he is my rock, and there is no unrighteousness in him.